The Keitelman Gallery was established in Brussels (Sablon) in 1981 by Maurice Keitelman. The gallery soon distinguished itself with an exhibition programme featuring the most important figures of modern American art including Alexander Calder, Barbara Kruger, Roy Lichtenstein, Robert Mangold, Robert Rauschenberg, Sol LeWitt. It is one of the few Belgian galleries to have mounted an exhibition with Nam June Paik, in 1990, during the artist's lifetime. It was the first Belgian gallery to exhibit graffiti art with artists including Jean-Michel Basquiat and Keith Haring. Avi Keitelman joined the gallery in 1991. In 1993 the gallery was invited to take part in the prestigious Maastricht art fair, TEFAF, and has continued to show there ever since. The gallery has also taken part in several other international art fairs. Since then, the gallery has focused principally in seeking out important and historic works by 20th century artists, including Jean Arp, Josef Albers, Marcel Broodthaers, Salvador Dalí, Jean Dubuffet, James Ensor, Max Ernst, Lucio Fontana, Yves Klein, Fernand Khnopff, René Magritte, Joan Miró, Pablo Picasso. Its clientele includes museums such as the Metropolitan Museum and MoMA in New York, the Art Institute de Chicago, the Musée d'Orsay and the Musée d'Art Moderne in Paris. 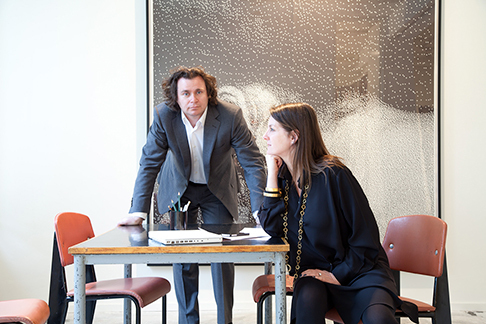 In 2009, Avi and Valérie Keitelman took over the gallery and inaugurated a new space at Rue Van Eyck 44 in Brussels. The gallery re-established its exhibition programming, proposing an ambitious programme of encounters between modern and contemporary artists. It collaborates actively with international artists such as Claude Cortinovis, Mounir Fatmi, Ron Gilad, Gabriele Di Matteo and Gal Weinstein. The gallery's curatorial approach is based on deep knowledge of art history combined with a stimulating eclecticism. The gallery collaborates regularly with international institutions for the loan of works for temporary exhibitions, including the Magritte retrospective A to Z at Tate Liverpool and the Albertina in Vienna in 2011, the Magritte exhibition Mystery of the Ordinary 1926-1938 at MoMA in New York, the Art Institute of Chicago and the Menil Collection in Houston, in 2013-2014, as well as Lisette Model at the Jeu de Paume in Paris in 2009-2010. The Keitelman Gallery provides support in the acquisition, expertise and sale of works, focusing on both the artistic priorities and financial requirements of private collectors, in the common pursuit of excellence.